I'm Here. I'm Queer. What the Hell do I read? : Book Banning Happens Again... 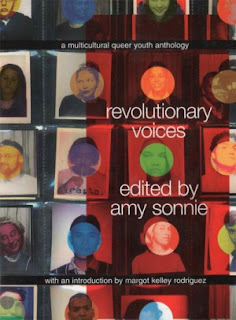 This Time In New Jersey, for "Revolutionary Voices: A Multicultural Queer Youth Anthology"
Book Banning Happens Again... This Time In New Jersey, for "Revolutionary Voices: A Multicultural Queer Youth Anthology"
Okay, there's a whole article here about how this book wasn't actually even officially challenged, reviewed, and voted on - but that one woman objected to it being in the library, a librarian agreed with her, and it was pulled. to remove “Revolutionary Voices” from circulation, though “no official challenge” was made, and “no actual vote by the commissioners” was taken. The emails reveal that Sweet not only wanted the book pulled off the library shelf, she wanted to get rid of any trace of it. This is a book cited by School Library Journal as one of the best adult books for high school students in 2001. SLJ said of "Revolutionary Voices:"
You can even click at the bottom of this article and download the entire series of e-mails! It's pretty harrowing reading, how people who should know better use their own ideas of what's comfortable (or uncomfortable) and try to impose that on the rest of us. I'm very grateful for the ACLU exposing this to light - and also to Liz B. of the great kidlit blog A Chair, A Fireplace, and a Tea Cozy - now blogging at School Library Journal! Who was called out in the emails as breaking this news. It turns out the book has also been removed from one of the local New Jersey high school libraries - also in response to the same woman's complaint! The book's editor, Amy Sonnie, pointed to a letter from a 15-year-old boy, who said that on reading the volume he was relieved to discover "that there were other people out there who shared elements of my identity". "Queer students may not feel safe speaking up when LGBTQ books are challenged," said Sonnie. "But, they certainly deserve a chance to discover the 'diversity of voices' that make balanced library collections so crucial for the health of our communities and democracy." The more scrutiny situations like this get, the more reluctant other librarians and library directors will be to summarily remove books from their shelves without due process... And hopefully, minds will change. That's one of the great powers of books, right? Oh, and "Revolutionary Voices" is out of print, with the cheapest copy available being $149.00 on Amazon. If it's not in libraries, how exactly are kids going to get access to it? In response to all the banning, a bunch of artists got together and staged readings this month of the book - I found out about them here at the Bitchmedia Community Lending Library site. Isn't that an awesome idea? Book Banning. Happening right now. I like the idea of staged readings. What about you? What do you think would be the best response to this kind of banning? ps- my thanks to Lulu and others who sent me links and wanted to make sure I knew this was happening!